The third major snowstorm of this winter of extremes knocked out power to more than 42,000 homes in businesses in Virginia with Patrick and Henry County hardest hit while owner scattered outages were reported in Floyd County. Appalachian Electric Power (AEP) said more than 20,000 Henry County customers remained without power this morning while 7,500 plus homes and businesses were dark in Patrick. Thousands also lost power in Carroll, Montgomery and Roanoke Counties along with widespread outages in deep Southwestern Virginia and the Highlands. On Interstate 81 in Wythe County, a tractor trailer jack-knifed and struck and killed a North Carolina father and son who had stopped to help a stranded motorist near the Rural Retreat exit. 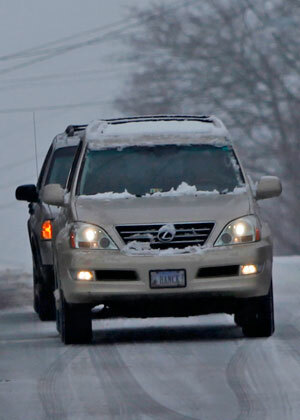 Roads throughout the region remained slick and dangerous as sleet and freezing rain fell overnight Friday and another 1-3 inches snow were forecast to fall on Saturday. Accumulations ranged from 8 inches to more than a foot in Floyd County. Advice from the Virginia Department of Transportation: If you don’t have to be out, stay off the roads. They’re extremely dangerous. In Floyd, some residents didn’t open Friday. Others closed early. The Floyd County Store canceled the Friday Night Jamboree for the third time this winter. Counting Christmas, which came on a Friday, the famous event has been dark four times since Dec. 18. Dave Nathan and Mark Warren at the Country Store said they had a good lunchtime crowd and business had been “better than expected” given the weather. At Pizza Inn, owner Casey Clinger dished up pizza to a couple who took a break from plowing the snow and fielded some phone calls for takeout. At Food Lion, about a dozen people shopped for food and joked about the weather. “I’m thinking spring,” one lady joked. “It can’t come soon enough. UPDATE (6:30 p.m.): Power outages continue to plague surrounding counties with more than 27,000 AEP customers affected, including 15,200 in Henry County, 4,441 in Patrick and 2,041 in Franklin. Only sporadic outages have occurred in Floyd County. AEP says power may not be restored to some customers until Tuesday or Wednesday of next week. Many church services canceled for Sunday. Check with your church before venturing out on the road. Lows tonight will be around 15 degrees so keep an eye on your water pipes and expect ice on roads Sunday morning. Glad you stopped in to Pizza Inn yesterday…we did a lot more business than I thought we would. Keep in mind we’re open in any weather…and even when the power is out…the generator sure does come in handy!! 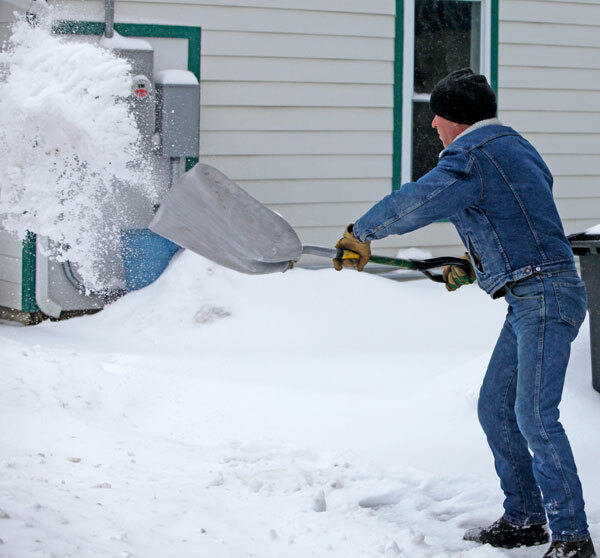 My Wisconsin friends aren’t sympathetic …”It’s your turn!’ Enough Already! 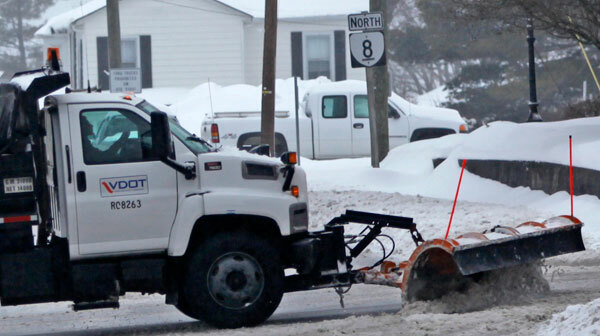 You can’t blame AEP for this one — it was an equal opportunity blizzard. A friend of mine in Spotsylvania County lost power. Rappahannock Electric says it won’t be restored until Monday at the earliest. Lower Delaware and southernmost New Jersey got hit hard. My landlady’s son drove to Cape May today to dig out a home where one of his girlfriend’s relatives lives. Because there’s no power at the docks the Cape May ferry is shut down until tomorrow. Best news of all? Washington DC and its suburbs got nearly 3 feet of snow. Oh, to turn on the TV and see the national media moan that the center of the Empire is paralyzed! As if that’s not enough I lost Internet access at home yesterday (I’m posting this on a public terminal in a library). My ISP’s tech support walked me through and told me a virus got into the CPU. Have to take the CPU to a computer shop tomorrow — hope it doesn’t cost me $1,000 to eradicate the virus. Another fine example of Winter drivers in action. It looks as if the following vehicle might get bombarded if the lead vehicle ever uses the windsheild wipers or that dangerous rooftop snow should come loose. We need a few more Back Off Buddy bumperstickers. Why o why o? In this case, the two vehicles in the photo were stopped at the stop light in Floyd.